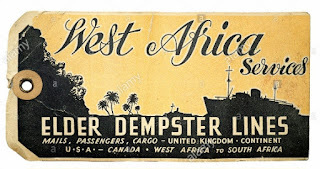 I've regaled you before, (regular readers of the Saturday blog), with stories of how I was born and brought up in West Africa; Nigeria to be exact in the 1950s, when it was still a British colony. My dad was a missionary out there and my mother a nurse. It meant I had an unusual but very interesting early childhood (until age five when we moved permanently back to this country). My parents were entitled to a three-month break every couple of years. It was known as furlough (my word of the week) and gave them the opportunity to return to visit family in England. This was way before the era of affordable commercial plane travel and so sailing was the only practical way to make the journey. It took up to two weeks each way with frequent stops at various ports en route to drop off and pick up mail, cargo et cetera - an exciting and exotic adventure for a small boy. From my childhood I retain an abiding love of all things connected with sailing on a proper steamship: the comforting thrum of the engine-room vibrating deep in the vessel; the constant sound and motion of the ship driving through waves; the smells of salt, tar, oil, funnel-smoke; the tang of sea spray; the bright froth left in our wake; days of dazzling sunlight and the sheer expanse of openness all around. 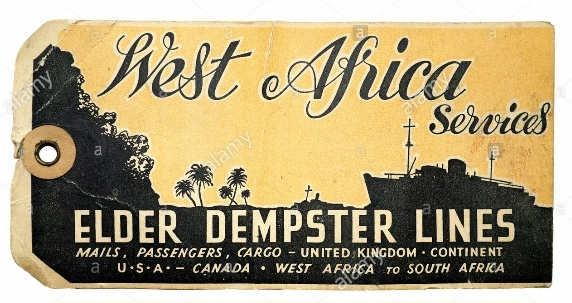 Today's poem is inspired by my second voyage from West Africa to England on the MV Calabar, a merchant vessel of the Elder Dempster line. I was only a baby when I made the first trip, but by the time of this second sailing I was rising three and capable of taking it all in. 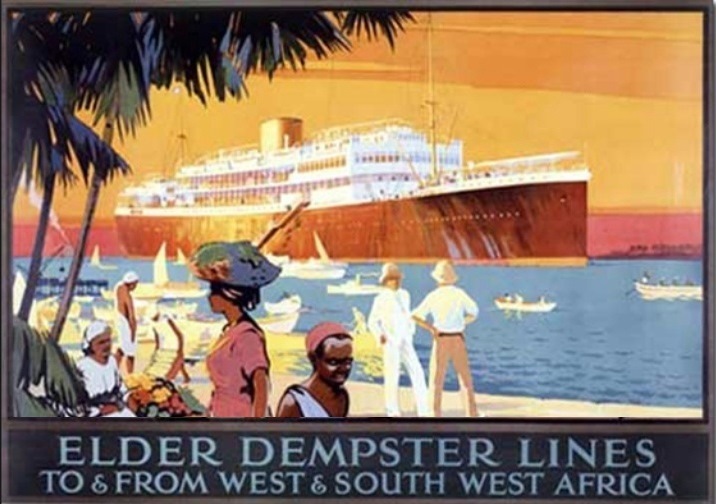 The Calabar was essentially a cargo ship with provision for a few passengers. Young children on board were something of a rarity and according to my mother I was 'adopted' by the sailors and made a great fuss of as an inquisitive young lad. My parents being very religious, I was well versed in notions of Heaven and Hell, so when I was told we were sailing from Lagos to Hull, I assumed it was a mis-pronunciation of the latter and that Hell was where we were bound! Apparently the sailors on the MV Calabar took a great and frequent delight in asking me where we were sailing to - for the amusement of hearing my earnest reply that we were sailing to Hell. Where are we sailing to, sonny boy? We're going to Hell, mister. And what will we find there, funny boy? I can't tell, I've not been before. and jellyfish pulse down below. Where are we sailing to, sunny boy? I've told you, we're going to Hell. And what'll we do there, bonny boy? We'll all go ashore and explore. as the engine-room rattles below. it's people are pale and wear too many clothes. and the rain is bitterly cold! When are we sailing to sunny days? I don't like it here in Hell. and stay there for evermore! As interesting and entertaining a blog as ever. 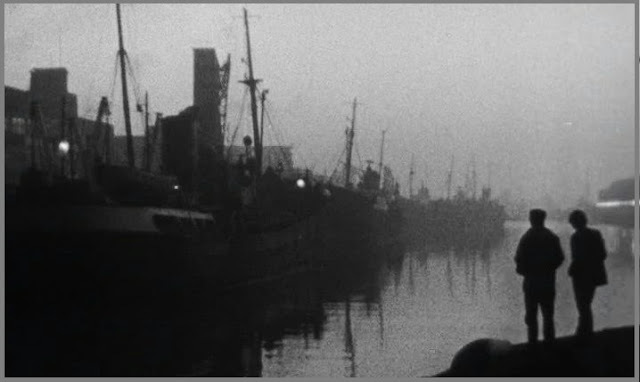 I have just one reservation about your poem - it seems to me it depends on the scene you set first (where Hell = Hull as seen through the eyes of a child) for it to work. Read out of context I'm not sure it would make as much sense or have the same impact. I got the sea shanty idea. God, Hull looks grim! No wonder you couldn't wait to get back to sunny Africa. Interesting as always and I really like the poem, especially the verse that begins "Hell is so green it bruises the eye". Brilliant.